For my full Laugaveurinn Album, click here. 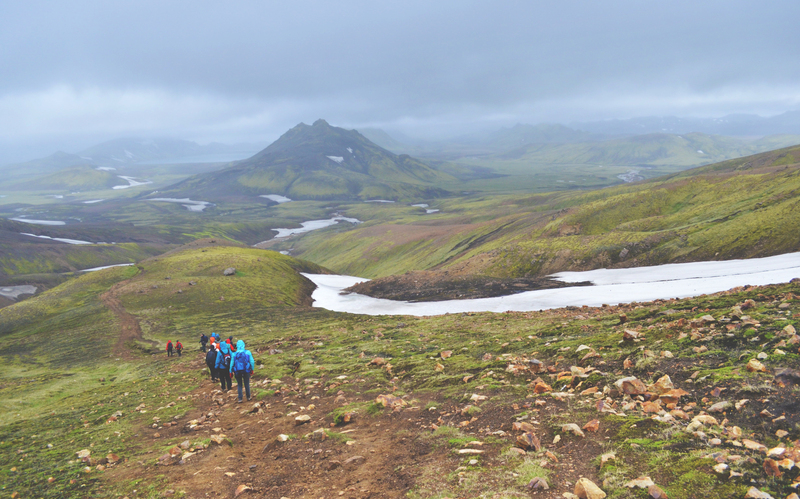 When I was researching for this Iceland trip, I stumbled on an article on Backpacker magazine about this hike that recently reopened, after being rerouted following the 2010 eruption. 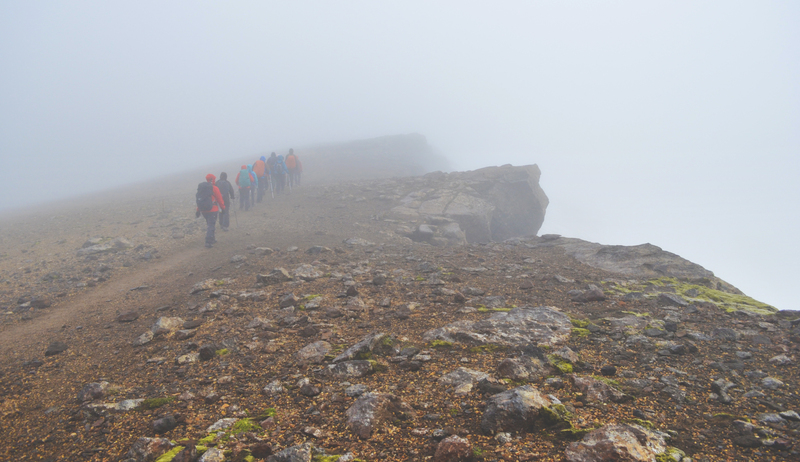 This famed hike was called Fimmvörðuháls, and is the tail end of a longer hike called Laugavegurinn (Laugavegur for short, even though it’s not much shorter). 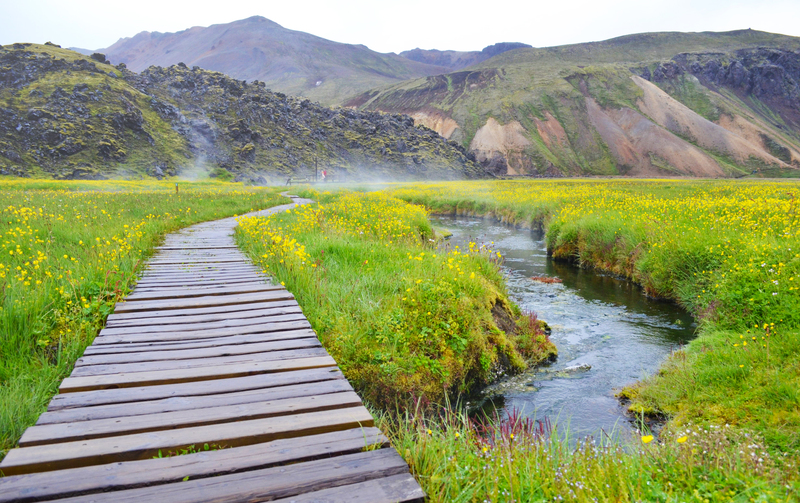 Laugavegur was actually named one of the top 20 best hikes in the world by National Geographic! That’s about all the convincing I needed. Make sure to check out the Travel Tips sections for the logistics of how I planned this epic hike. I ended up joining a guided hike tour as this made the most sense for me as a solo hiker. 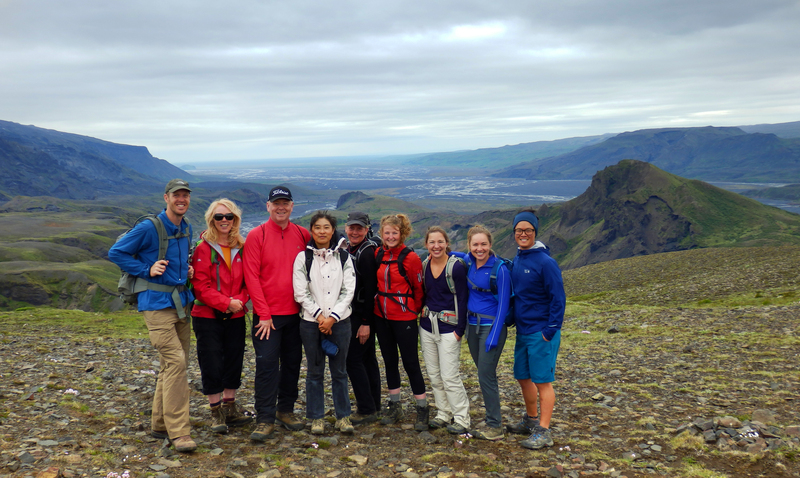 It was a great mix of Icelanders, and foreigners (half and half!). Everyone was super friendly, and I became pretty good friends with a group of Americans (Shawn, Laura, and Maggie), and Bryndis (one of the Icelanders). They were awesome company in the 6 days that we were hiking and I really couldn’t have asked for a better group. The trail is well marked with periodic blue sticks to mark the track. There are different camps along the trail that you can set up your tent on. Alternatively, you can book accommodations for relatively cheap at the cabins that are at every camp. Most of them are humble, but they have a cooking area, as well as hot showers so it makes for a much more comfortable stay after hiking for 16-22km. We start off in the hot spring area of Landmannalauger, where the little creeks bubble from the geothermic activity below. I’ve never been in a natural hot spring, and it’s really neat! You follow the boarded walkway to the entrance area, and you make your way to a warm spot trying not to freeze your nips off. We went in mid June and it was rather chilly still (around 10 degrees or less). The next morning we hike through fields of obsidian, glaciers, ice, and melting run-offs. This was by far the dirtiest day since there were quite a few muddy areas that we had to get through. And seriously who likes hiking for 5 hours in muddy boots? This was also the day where we made it up to 1400m+ elevation if I remember correctly. The mountains were shrouded in thick clouds and mist. The wind eventually reached what felt like gale force speeds. So even though it wasn’t raining, everyone’s left side was soaked because of the mist/clouds being blown. Towards the end of the day, we reach Aflavatn, a beautiful lake surrounded by mossy green mountains. This was one of my favourite camps. Several other groups were hiking the same trail, and since there is one communal eating area, you never know who you might meet. There were a couple of Americans, a few Canadians, and a group of Spanish people doing the hike too. It was great getting to chat with these people. I should note that if you’re going with a tour, take advantage and pack yourself some good food and booze, as these are transported from camp to camp for you by a super jeep. You only need to carry a daypack with snacks and water. So while all the foreigners in the group were eating freeze dried food, the Icelanders ate like kings. Among their arsenal of gourmet meals were: meatloaf, homemade soups, fresh salads, cold cuts, bread, sausage, and BEER! 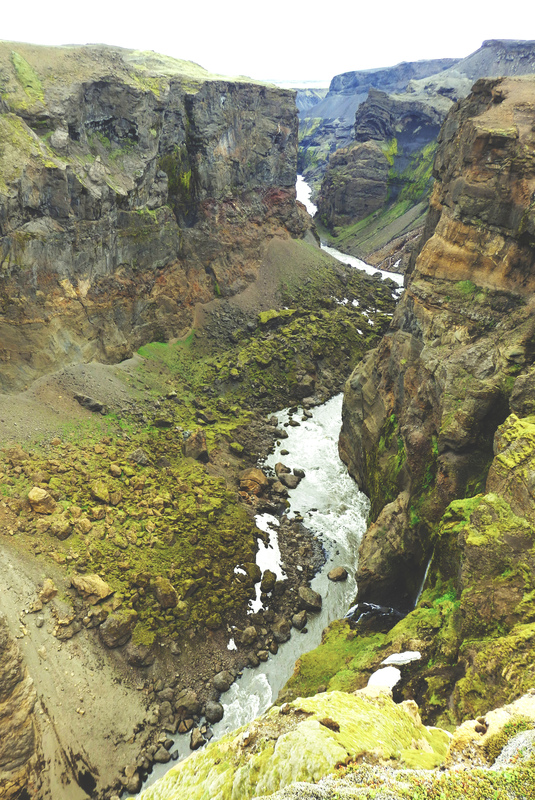 Markarfljótsgljúfur canyon. Thanks Asa for the name because Icelandic is seriously impossible for foreigners to pronounce. As the days go on, the landscape changes from very mountainous to relatively flat. We hike through dirt paths, do some river crossings, and encounter an almost desert like landscape of black sand. Super cool! 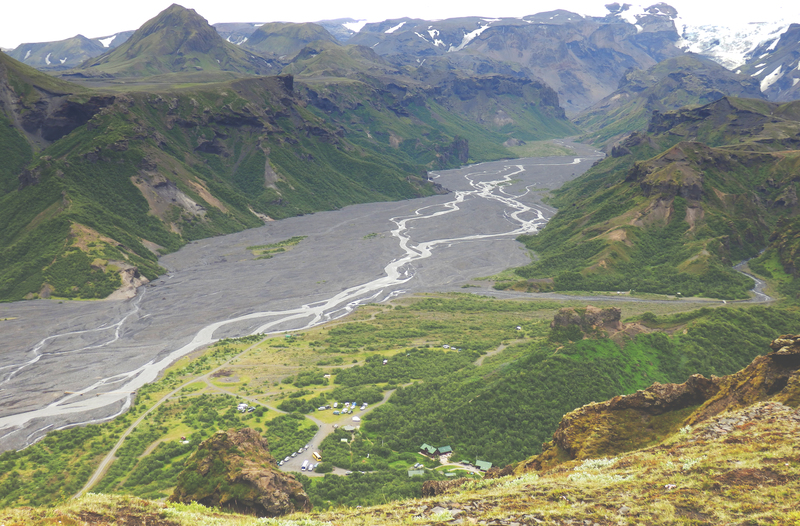 Our final destination is Þórsmörk (Thorsmork, after the Norse god, Thor), a grassy area, where the two main campsites are cut by a wide riverbed with a number of creeks running through its length. This is by far the most decked out campsite of the cabins we go to. Large sleeping quarters (I got the loft to myself! ), kitchen area, picnic area, and hot showers. Its apparently quite popular with Icelanders in the summer. We spend two nights here, hiking around the area. On our last night, we’re treated to a BBQ lamb dinner. For those who don’t know, the sheep here roam free during the summer months. They’re collected in the fall, and it’s a community event to help sort. This sorting brings the community together, and gives opportunities for people to socialize and celebrate. Long story short, this is by far the best lamb you’ll taste, as the animals are free to roam free and eat grass, flowers, moss, pretty much as natural as it gets. 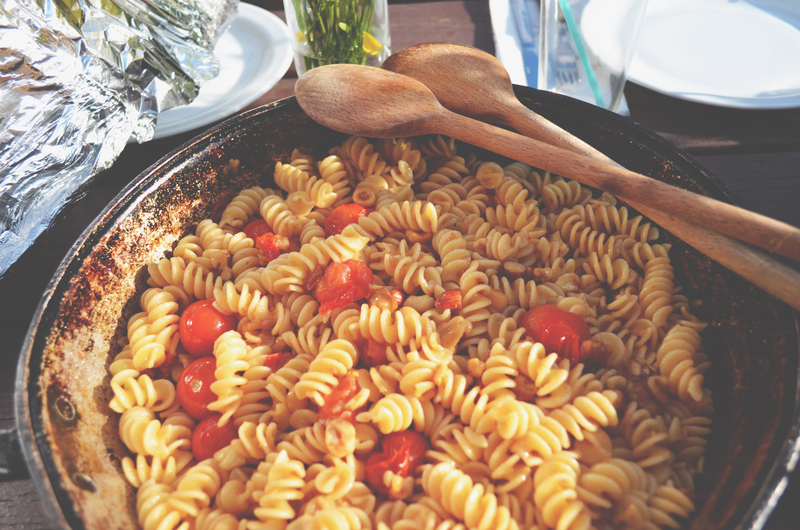 Maggie and Bryndis were vegetarians, so I managed to make a toasted nut pasta with tomatoes for them. Laura had to pick out the nuts from a bag of trail mix. Talk about getting creative eh? And most importantly, our guide Asa’s family came by from town and brought us a selection of Icelandic beer. Sick! One of the most interesting moments of this epic trek was the bonfire we had with the other campers on the last night. Lots of families gathered around this huge campfire, and sang Icelandic songs I had no idea where about. Curiously, they eventually sang a rendition of “Country Roads”, by John Denver. Somehow, this song became synonymous with this hike. Whenever I hear that song, it takes me back to the wonderful people I met, and the good times I had. If the opportunity came, I would jump to do this hike all over again in a heartbeat. I searched a bunch of blogs and travel companies to determine who I should do this hike with. Since I’m a solo traveler with little multi-day hiking experience, it became obvious I should not attempt this on my own. The logistics of carrying everything from camp to camp (including all your food and garbage) makes this a daunting task. There are companies that provide food, but will charge close to $1400 for a 6-7 day trip. NOPE. I opted to go with Utvist, a company that runs guided hikes with experienced local guides (reminds me of MEC). 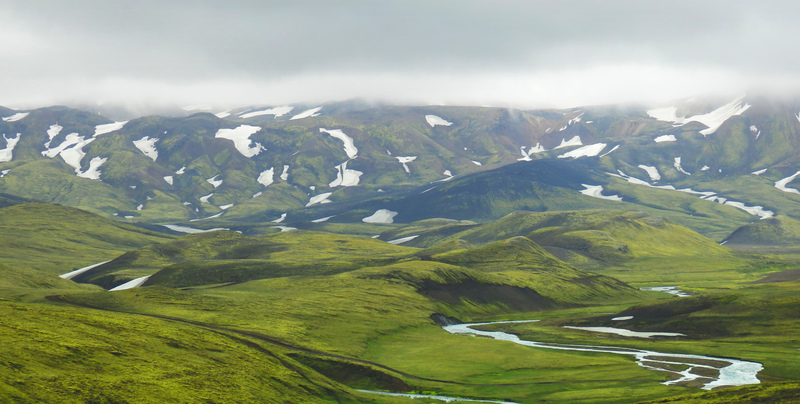 They offer both the Laugavegur and Fimmvordulhals guided hike. My guides, Asa and Bjork were friendly, knowledgeable, and could hike for days. I also liked this company because I got a chance to mingle with the locals. I paid ~$680 for a 6 day guided hike, which included the lamb BBQ on the last night, and transport for my bag from camp to camp. A few things on logistics. Utivist uses a super jeep to get your stuff from camp to camp. Not all groups that we encountered had access to a vehicle that could traverse the rough terrain. The morning after Aflavatn, we realized we needed to do an intense river crossing. No biggie, except the water is 2 degrees and goes up to your waist. Luckily, our vehicle came around and drove use in groups across the river. I really felt bad doing this while watching those poor people stripping down to their undies and crossing the river. Yikes. Another note on the super jeep: take advantage and pack a box of real food (its cold enough to pack fresh items) like fruits, veggies, prepared meals etc. And pack some wine or booze. Nothing like having a drink with a spectacular view after a long day of hiking. Attempting to do this without a tour? Its definitely doable, although I think its easier to do this during the popular months of July and August. The weather is more stable, and the trail is more grass and less ice and snow. More people means it’s easier to follow and not get lost. Although there were many campers we encountered, it looked pretty rough. For example, people were trying to set up their tents in the first night at Landmannalauger, and they were literally blowing everywhere in the wind. Even large rocks could not keep them flat long enough to set up their poles. I cant imagine it was a comfy night’s sleep for them. The cabins have limited space and fill up fast. You have to reserve your spot well ahead of time and most will cost you $30-40CAD. More information on the cabins here. One of our guides, Bjork, has recently published a photobook on Laugavegur! Check it out here.